The name of our newsletter — INFINITE SENSITIVITY — is inspired by one of Brother Wayne Teasdale’s key statements about his own vision of God: "God is infinite sensitivity". It is by infinite sensitivity that we can reach across current gaps within the enormously rich variety of spiritual experiences and teachings, in both duality and non-duality, that characterize our lives and world. Honoring them all may help humanity to proceed to transformation and find peace in an overall awareness of One. IS invites and offers contributions from all fields of spiritual experience, healing, and teaching from individual perspectives. Everyone is invited to share, from the heart, personal or group queries, insights, awakenings and “dark nights of the soul”, as well as highlights and summaries of new projects and initiatives. As our cooperation is based on self-selection, we favor articles from a personal ground, less so articles by persons represented as „officials“ of this or that tradition, organization, or group of followers. We try to share on a basis of equanimity. IS aims at eliciting depth and mutual understanding. 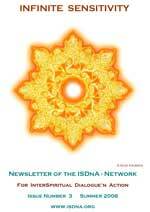 We wish to expand our awareness to all paths of spiritual every-day life. We honor the experience of resonance through beauty in nature and art, compassion and cooperation, vulnerability and joy, stillness and celebration, as an essential gift for humanity. All contributions to this part of the newsletter are especially welcome: photos, works of art, poems, short stories, etc. 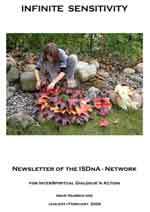 IS mirrors the major activities within our ISDnA network. It is, therefore, a platform for information and networking among circles, focus-groups, satsang-groups, service- and action-projects, and innovative ideas. Relying on the innate wisdom of all beings and groups, we encourage forthcoming initiatives and events as an expression of our shared natural intelligence. IS also welcomes contributions about global balance. This includes topics on indigenous peoples and their shamanic practices, both in traditional and newly created settings as well as attention to matters of justice and suffering where the spiritual voice can work for transformative change. We focus on resonance within the universe and mother earth, as in the sacred feminine and the sacred masculine, gaia, and cosmology, all with a loving eye. Get inspired by a group of strangers who met in Peru: Creating an interspiritual gathering without a set agenda opened hearts for deep experience and wisdom. AND: Who will be the new editor of Infinite Sensitivity? READ IT and get inspired! A Call to attend the Common Ground Conference Sept. 1-3, 2006 - focussed on Bro Wayne Teasdale's vision of an InterSpiritual Age, based on the HEART of humanity and all beings in the universe. Kurt Johnson and Gorakh Hayashi share the key points of this vision and their experiences in various circles each one has initiated. Matt Mitler, director of the Dzieci theatre group (NYC) shares from the heart his spiritual journey as an artist. READ IT and get inspired! Ever heard of Interspiritual television � Living Earth TV? Ever seen paintings by Cristina de Oliveira, a Brazilian mandala creator? Want to try out psychodrama as a spiritual ritual? 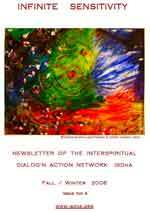 Read and enjoy our full-color newsletter with more articles: on Muslims' task to inspire Peace, and on Sacred space and Intimacy. Read about Brother Wayne as protrayed by two close friends, on his global vision and the role of authentic friendships in an interspiritual world. 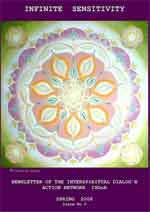 Annette�s exploration of a woman�s awakening and integrating all aspects of form and matter into daily life offers a counterpoint to both eastern and western teachings of renunciation.